What could be better than a slice of Key Lime Pie in the summer? 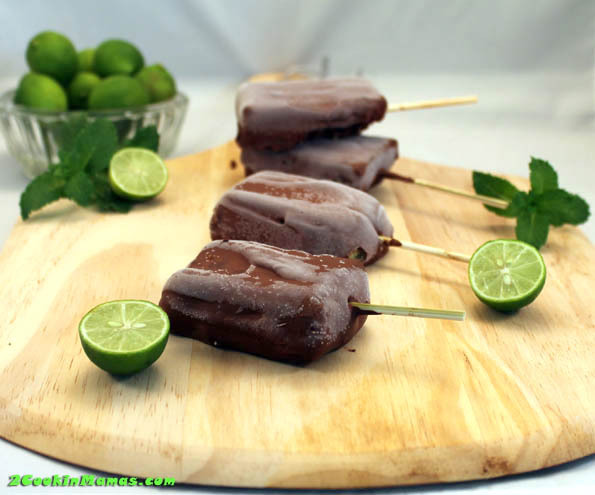 How about Key Lime Pie on stick? 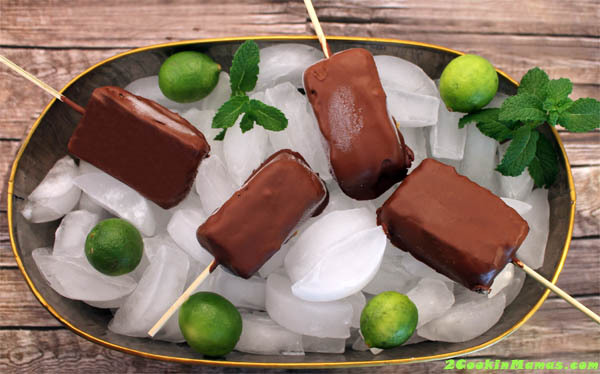 Today our friends at 2CookinMamas.com are showing us how to make this yummy creation. Hope you enjoy! Hi! 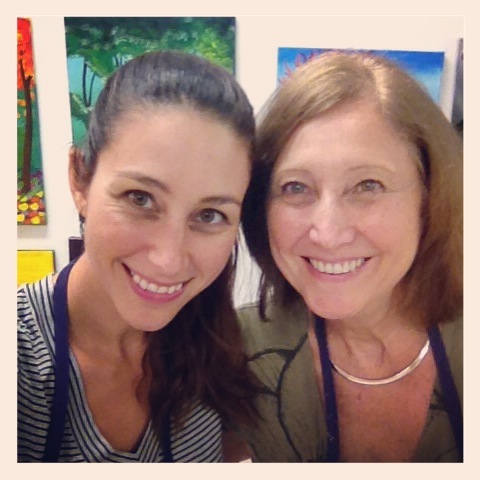 I’m Linda and I blog with my daughter Christina on 2CookinMamas.com. We love to cook, eat and repeat and often do so with a mama’s cocktail in hand! But…we lead a double life, in the kitchen that is. I enjoy making yummy desserts and gourmet meals while Christina enjoys gluten-free cooking. We both work outside the kitchen too so all our dishes are created to be quick and easy for Moms-on-the-go. Christina is a certified nutritionist & DDP Yoga instructor and I’m a VP of Marketing & Sales. We recently published our very first cookbook for the expecting Mom: The Pregnancy Cookbook, which has over 60 delicious, healthy, quick & easy recipes as well as nutrition tips for Mom and baby. We’d love for you to stop on by and grab a recipe or just say hi! And if you try one of our recipes please let us know by leaving a comment and sharing the love! 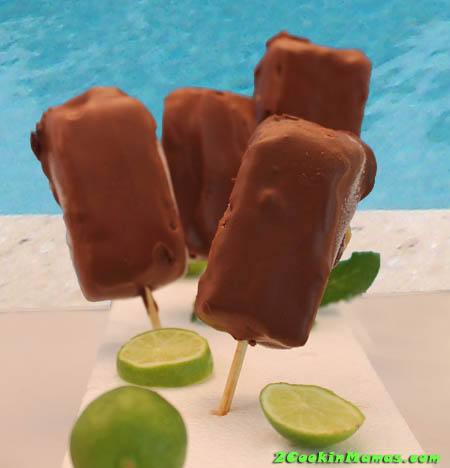 Jerri was nice enough to extend an invitation to us to be guest bloggers on her “Summer Themed” recipe series. We are thrilled and we can’t think of a better blog to be associated with. Thanks Jerri and now on to the recipe. Summer always brings to mind the Florida Keys. Living in South Florida, we are only about 2 hours away from the northernmost key, Key Largo, and about 4 hours from Key West, so it is only a hop, skip and a jump to get away for the weekend. And the Keys are so laid back, I mean really laid back, so much so that you feel like you are a world away from the mainland. 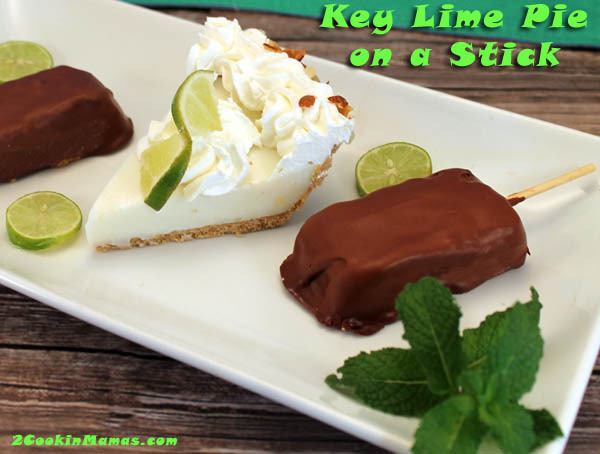 One of our favorite desserts that seems to only be offered in the Keys is Key Lime Pie on a Stick. What is that you say? 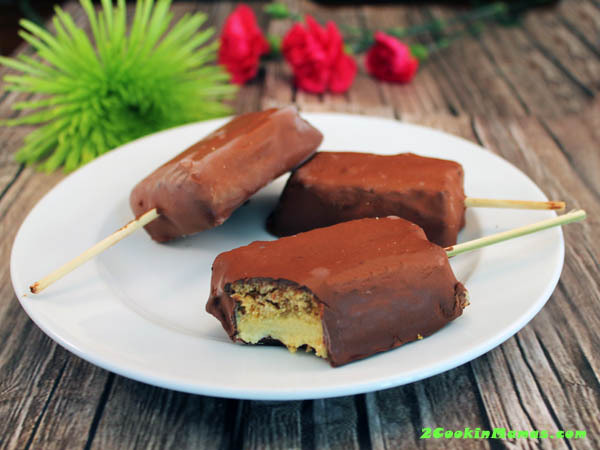 Well, it is a cold and refreshing piece of tart key lime pie, graham cracker crust and all, coated in sweet chocolate, and stuck on a stick for easy eating. Our version is smaller and rectangular instead of pie shape but just as mouth wateringly delicious as the original. Great for kids and adults alike on these hot summer days. Hope you enjoy! Preheat oven to 350 degrees. Prepare an 8×11-inch baking dish by spraying with a nonstick cooking spray then lining bottom and up & over long sides with a single-piece of parchment paper. This will make it easier to lift out to cut. Prepare crust by combining the graham cracker crumbs and sugar with melted butter. Press into bottom of prepared pan. Bake for 8 minutes and let cool on wire rack. Combine all pie filling ingredients and pour on top of cooled graham cracker crust. Bake for 15 minutes. Let cool for about 1 hour on wire rack then put into freezer for 4 hours to make the pie easier to cut into rectangles. Remove from freezer and, using a sharp knife, run around the outside of pie and make sure none of the filling or crust is sticking to the pan. Lift out carefully by grabbing the ends of the parchment paper and place on cutting surface. Cut into approximately 2 x 3-1/2-inch sized rectangles (4 across and 3 long). You should have 12 pieces. Place a popsicle stick in each piece, making sure stick is inserted into pie filling and not graham crackers) then place on a cookie sheet lined with wax paper and return to freezer for at least 3 hours. Remove pie from freezer and, holding popsicle stick, dip into chocolate then place back on wax paper-lined cookie sheet. Repeat with remaining pieces then return to freezer for 1-2 hours. Note: I found that it was easier to dip the top half and then spread the chocolate on the bottom half with a spoon. Take out and eat frozen for a sublime summertime treat. Thanks again to Jerri for the opportunity to introduce ourselves to her readers. Hope y’all enjoy the recipe and we’d love to see you over at 2CookinMamas.com. This is such a fun idea! I used to love pudding pops and this looks so similar, although I think I always had the chocolate pudding pops.